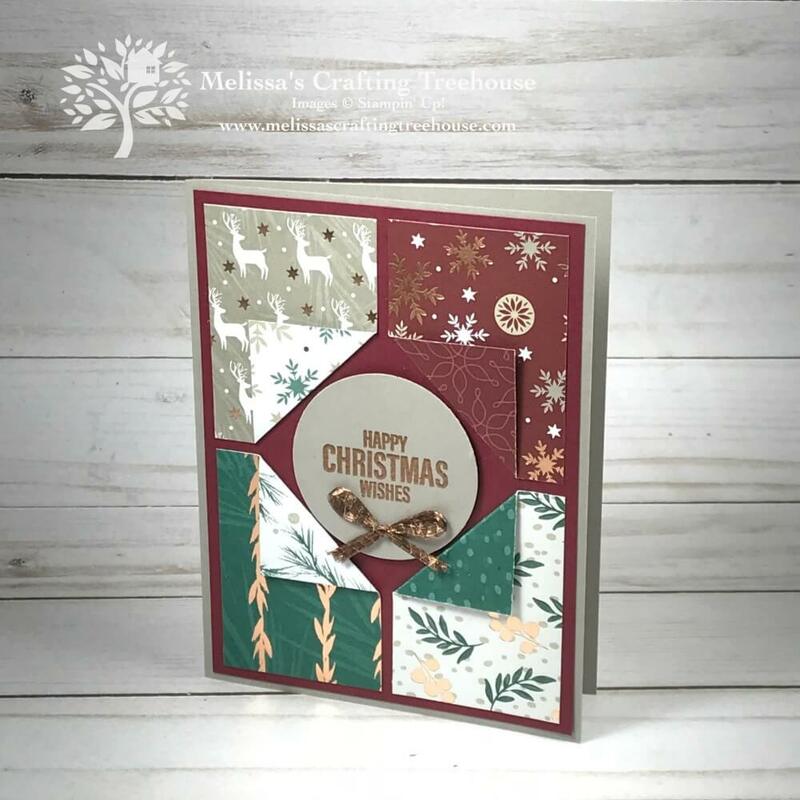 I’m just loving this simple Christmas card and enjoying playing with unique card folds! 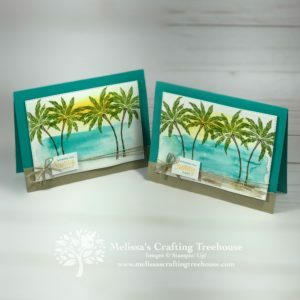 This card was my Alaska Cruise card swap and it was so easy to make multiples! I only made 20 but could have easily made lots more! I’ll be sharing two methods for putting this card together. The first method is fine if you’re just making a few but if you’re making lots I think you’ll enjoy my alternative method. Check out my video tutorial and visual tutorial just ahead. The possibilities are numerous for playing with the DSP and determining which side to face up, and where to place them. This is one of the best parts of playing with unique fun folds like this! On this second version, I’ve used the same panels on the top but changed up the DSP pieces used on the bottom. 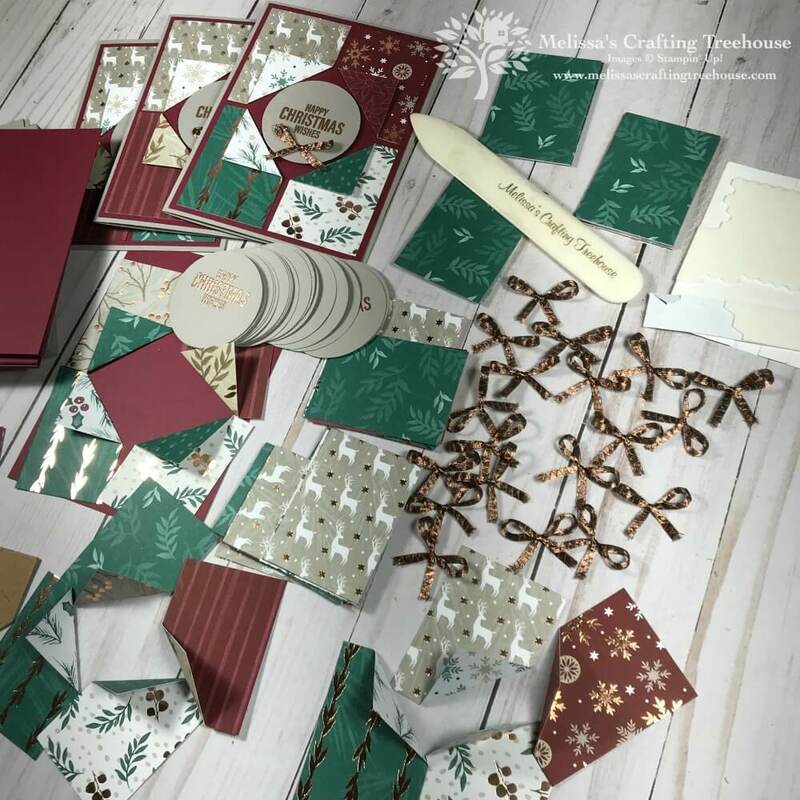 Prepare all the pieces for the card in batches. For example, create all your bows, cut all your DSP, heat emboss and punch out all the sentiment pieces. For projects that require a lot of punching, or another step that may be hard on your hands, you may want to make 10 at a time and then work on another step for a while. This just mixes things up and makes it easy on your body. When I cut my designer paper I made stacks of DSP in sets of four, for the four panels I intended to use on each card. 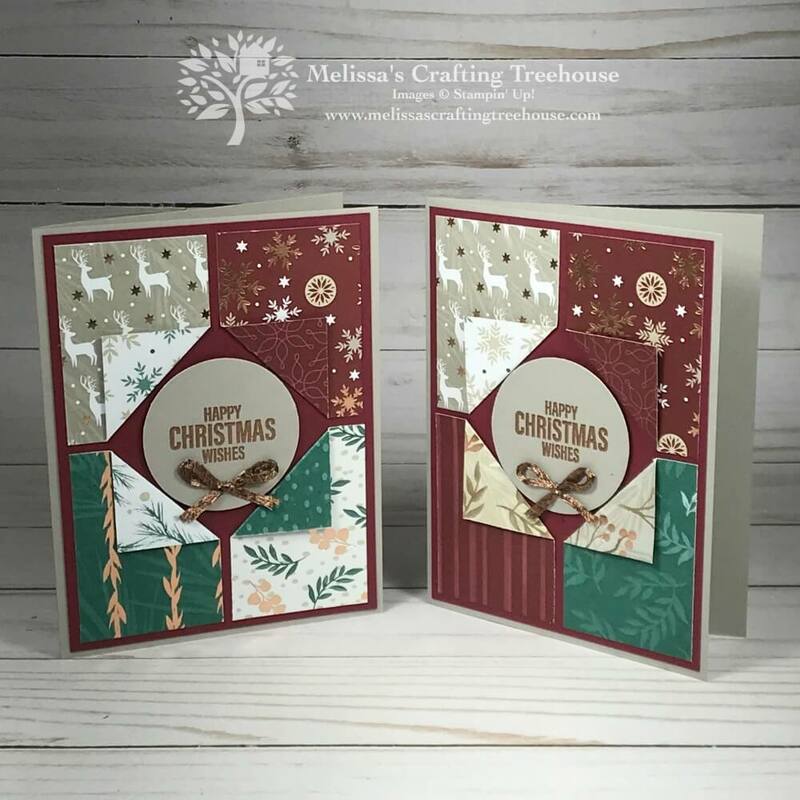 This made the process so easy when putting my cards together because the pieces were already collated for me. What you see below are little stacks of four pieces of DSP each card. The pieces that are folded in the photo below are the three configurations of DSP that I came up with and liked the most. They are already folded and ready to place on my Merry Merlot cardstock layer. For my second method, the one I think is easier for making multiples quicker, I did not pre-fold the pieces of DSP. Check out my visual tutorial ahead to check out that method. Since I was making a bunch of these, I made myself a little template for folding the DSP. I just figured it would make the whole process go much more smoothly! 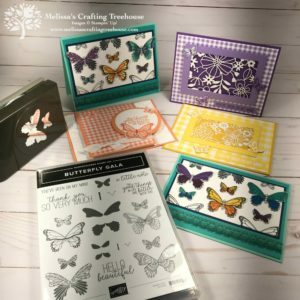 All the kits mailed out to Stamp Club members and Free Card Kit recipients included one of these little chipboard templates! Pretty sweet huh? I love to make my customers happy!!! Was this visual tutorial helpful? Let me know what you thought of it by leaving a comment below. A visual tutorial like this takes a bunch of time to create. I want to know if you found it useful!Plus, it will encourage me to make them more often! I hope you’ve enjoyed my project today featuring unique card folds. There’s a complete supply list ahead plus all the project dimensions as well. Make sure to check back soon to see the version of this card that my club members and Free Card recipients got, or will be getting soon! If you enjoyed this video and watched it here on my blog, please jump on over to YouTube to give this video a Thumbs up, Share it and Subscribe to my YouTube Channel. I would appreciate it very much. 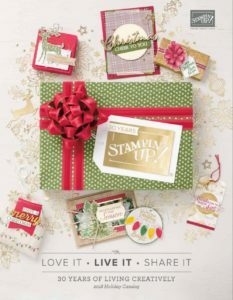 Learn how to get Free Card Kits in the mail by clicking HERE or consider joining an Online or In Person Stamp Club. Click HERE for more details about clubs. Thanks so much for spending some time with me today! 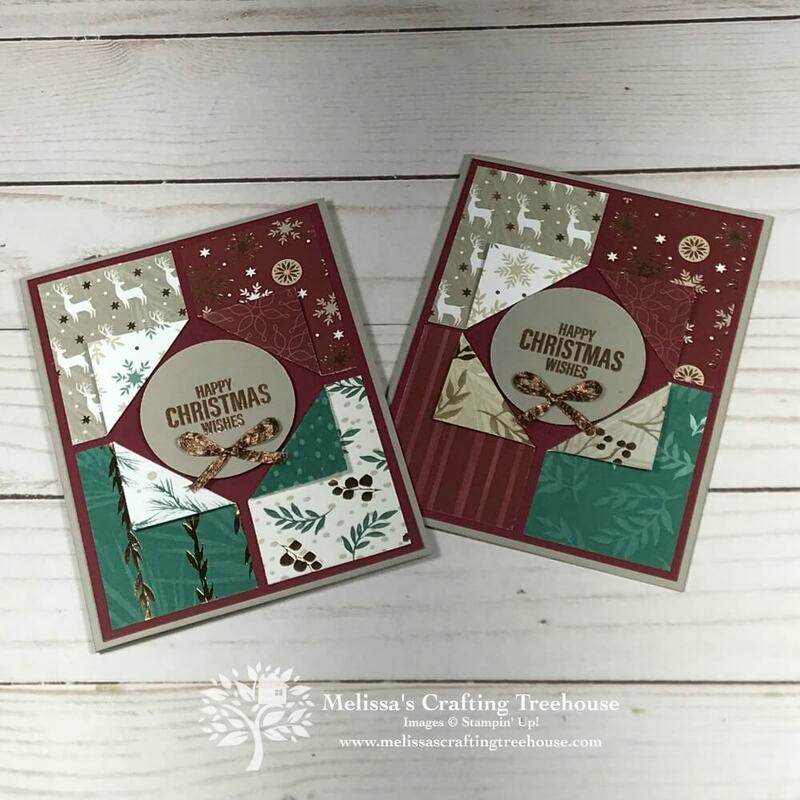 Christmas in October and Fun with Designer Paper – Includes a visual tutorial including a template for recreating multiples quickly! 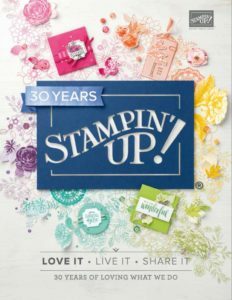 * Be forewarned… this post is from my Stampin’ Up! Blog and looks VERY different. I’m no longer posting on that blog but there’s lots of great content there! I hope you’ll go visit! Creative Escape Day Coming In October!… There will be an Online Offering too!!! LIVE EVENT DATE: Saturday 10/27/18 from 10am to 10pm! 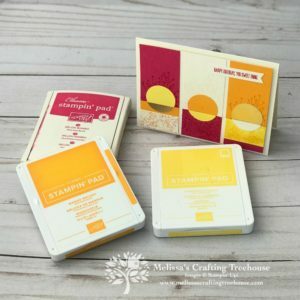 I just got the Joyous Noel paper in this week and can’t wait to play with it. So beautiful. It’s funny how the Holiday Catalog doesn’t show the true beauty of some papers. Thanks for your comment Leslie. I also love the Joyous Noel DSP. I often find it’s hard to really appreciate the beauty of DSP in the catalog. The Frosted Floral DSP is one where it is sooooo much prettier in person. I offer product shares that include DSP and bits of a few coordinating products from a given suite. That way people get to see and use the items without investing in a whole pack of anything. I always want to see products in person so the shares work really well for me as well. Enjoy playing and thanks again for taking the time to comment! I really appreciate it! Thank you, Melissa! Your visual tutorial is very concise and easy to follow. I can’t wait to try making this fun looking card. Thanks for the time and effort you put into sharing with us. 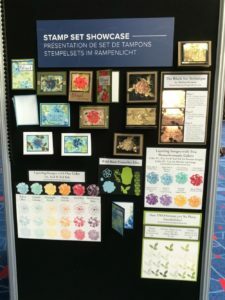 Thank you Hilda!I’m glad you found the visual tutorial to be helpful. Thanks for commenting and letting me know. I hope you’ll have fun playing and will share your creations too! Have a great day!!! 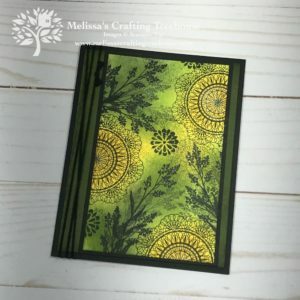 Melissa, the visual tutorial is a very good way for me to follow the introduction step-by-step. I can make a copy and put it on the desk. 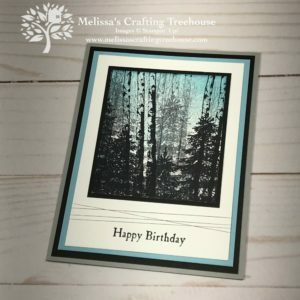 I found your blog some days ago and there are so many beautiful cards and ideas! Thank you so much for commenting Anke. I’m glad you appreciate the visual tutorial and are enjoying checking out the projects on my blog. Thanks for a great card design! I found this on Pinterest and think I will try to make a cut file on my Cricut. I hope that is okay with you. I will give you credit of course! I’m guessing that is a 45 degree fold but I will figure it out. So glad I found this! Go for it! Play and have fun with it! I’m glad you like the project! I think you’re probably correct about the angle although I didn’t check it. I did put dimensions of the cut in the blog post in case you haven’t seen that. Have fun playing!!! Thanks so much for your “essay”. I loved it and so appreciate you taking the time to comment and let me know so much of what you enjoyed in the post. If you search for Melissa’s Crafting Treehouse you should find me on YouTube, Facebook and Pinterest. I’ll look forward to hearing from you again soon! Thank you so much Bety. I’m so glad you liked my tutorial! Thanks for commenting and letting me know. I don’t plan on making the cards, but the step by step pictures on how to were so easy to follow. I love to see how others do things and your tutorial is GREAT!! Thank you. Thanks so much for your sweet comment Peggy. I’m glad to know you liked my little visual tutorial! Directions were spot on and I loved the visual tutorial and hop you will be making more in the near future. Very nice card!! Thank you so much Patt!